Targets are the foundation to a quality game. Better players hit Targets more often, as you improve your Target area for a quality shot becomes smaller and as you reach elite level failure to hit Target wil mean you most likely will need to do plenty of body work to recover for the next shot. The more you hit Targets the less winners you will need to play to win, this section is very important to fully understand, you should have your Target in mind every single shot just prior to striking the ball. 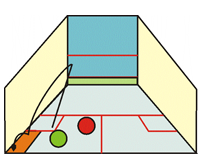 Your Target is where you want the ball to bounce and not on the front wall, your brain will calculate the height required depending on how hard you hit. As you get better your Target area will decrease in size, this is true for all standard players right up to elite players where the ball needs to be on the wall or there is a high chance their opponent will be able to play an attacking shot.